dinner in the house. A few more come in the afternoon. The children played with their fire crackers and us older folks visited. Lee had some fire works in the evening. we come home about nine oclock. I was very tired. Wednesday July 5th 1893 I sewed all the spare time I had on my black skirt that other gave me. I went up town late in the afternoon. weather very warm. Thursday July 6th 1893 Thee was a terrible rain storm last night and the day was intensely hot. I finished my skirt before noon. Lee came in with letters from the folks. I did not feel well and slept part of the afternoon. was up town just before supper. Will did not work on the road today. Friday July 7th 1893 I got my work done early and went over home for the day. I id not feel well. I laid down part of the afternoon. I walked home got a little supper over and went up town for my meat. 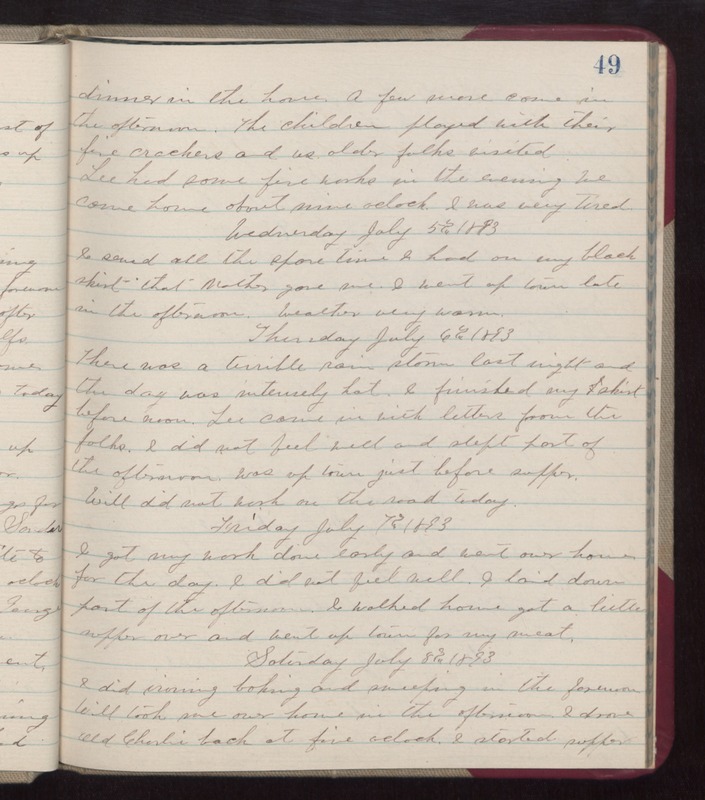 Saturday July 8th 1893 I did ironing baking and sweeping in the forenoon. Will took me over home in the afternoon. I drove Old Charlie back at five oclock. I started supper.